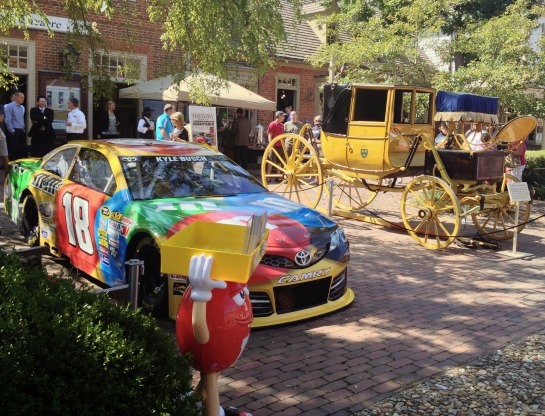 Today we're excited to share the details behind a recent day trip we made to Colonial Williamsburg to meet Nascar driver, Kyle Busch and his wife, Samantha and we've got a delicious giveaway at the conclusion of this post for one lucky reader! To give a little background, I'd been offered a set of media passes to attend the History Meets Horsepower event where Colonial Williamsburg and Mars Chocolate North America brought the excitement of Nascar to the Revolutionary City before heading to Richmond International Raceway for the Federated Auto Parts 400 Nascar Sprint Cup Series Race this past Saturday. The partnership was created to share our country’s rich transportation and culinary history and celebrates the evolution of each through modern times. 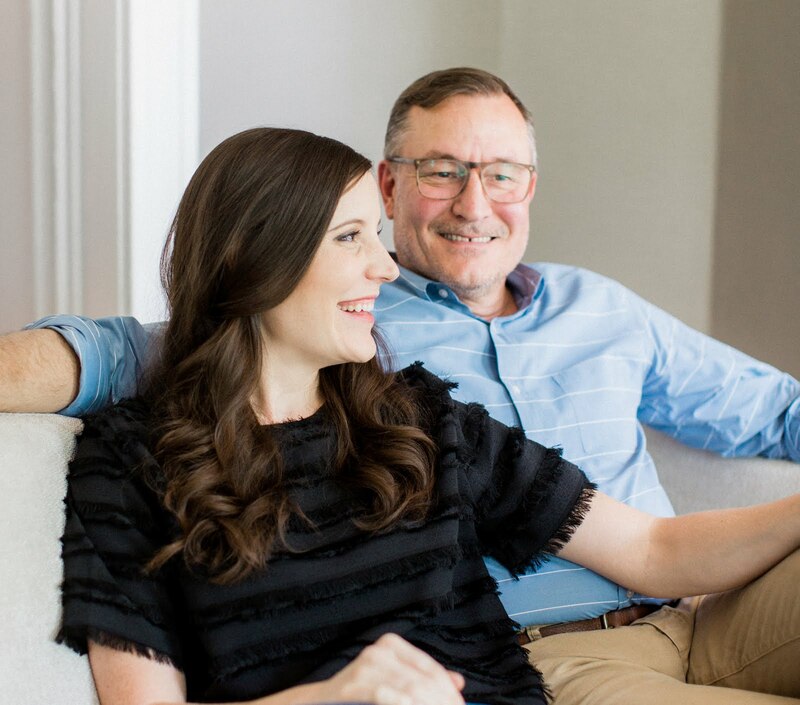 It sounded like an interesting culmination of several different things we're interested in — I grew up loving Nascar a little more than I care to admit, Mary's a chocolate fanatic and we're both into trying new things with local meaning and history. So with that, we hit the road for a little day trip in Colonial Williamsburg with Nascar on my brain and chocolate on Mary's. 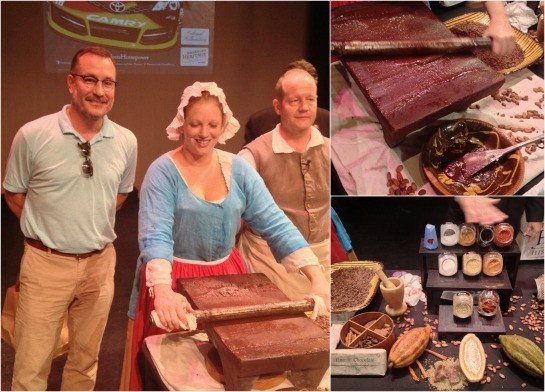 We learned about the History Meets Horsepower partnership and the rich American history of chocolate from the History Research Director at Mars Chocolate and one of the chocolate makers on site from the Historic Foodways program at Colonial Williamsburg. I have to admit, it was fascinating to learn how much work went into rendering even 2 tablespoons of chocolate back in the day along with all the complimentary spices that got incorporated to bring out different flavor variations. It's a true science and makes much more sense as to why it was such a prized delicacy. 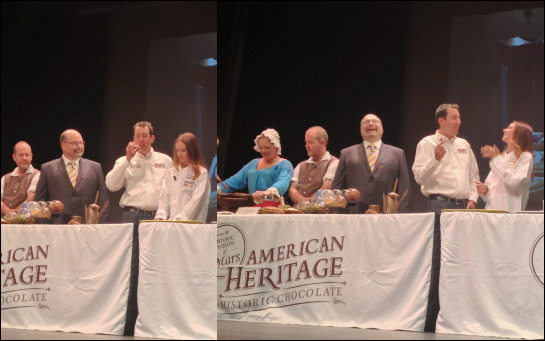 The same people demonstrating the chocolate rendering process on stage are the same ones working the Foodways program at Colonial Williamsburg where the public can come watch demonstrations first hand on how everything from chocolate to beer was made back in the 1800's. Next up, Kyle Busch got up to say a few words about the upcoming race. For those unfamiliar, he's the Nascar driver of the number 18 M&M’s Toyota Camry. We snapped the photo of his car paired next to a Colonial era wagon at the top of this post upon entering the event. 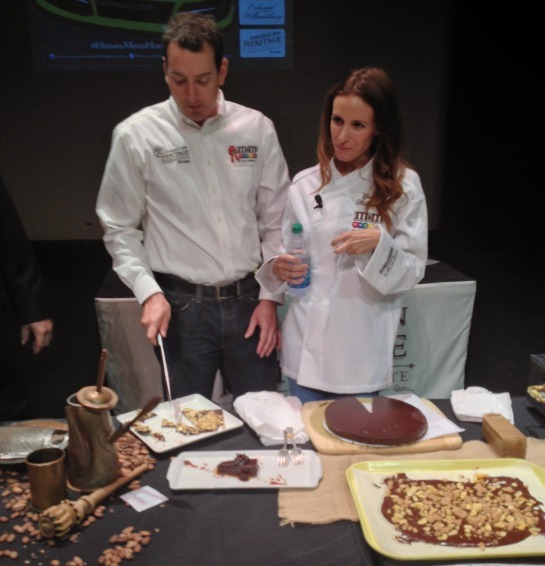 Kyle's wife, Samantha, also came up on stage to share a few recipes she'd created especially for the event, using (you guessed it) American Heritage Chocolate from Mars. It turns out Samantha is an avid foodie, writes her own lifestyle blog and even comes up with new recipes to try while on the tour bus with Kyle. 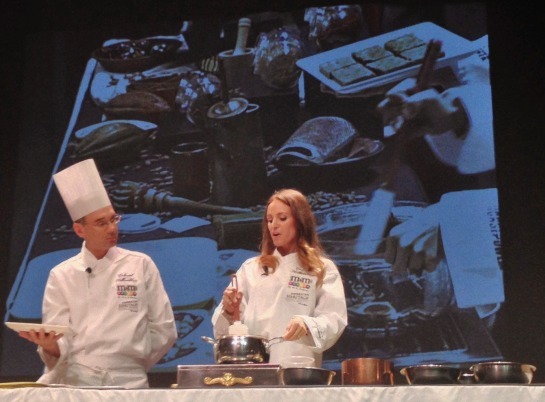 She did cooking demos on her recipes for chocolate bark and brownies, then the Executive Chef for Colonial Williamsburg, Rhys Lewis, shared a demo on his signature and decadent chocolate ganache tart. The pair was hysterical to watch — while a lot of planning obviously went into the overall event, it was the first time they'd met and worked together and the dynamics were superbly entertaining and funny. Once both recipes were complete, they brought Kyle up to sample them both, and he very tactfully said he couldn't pick a winner since they'd both been made with American Heritage Chocolate — there's a smart man if you ask me. 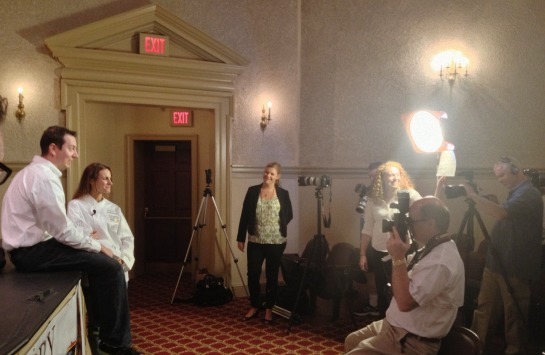 After the cooking demo, those with media passes (that's us, score!) were invited to come up on stage to meet Kyle and Samantha, getting a chance to taste all of the recipes they'd just made. They both seemed down to earth and good natured about the entire experience. Everything was put together so well. After the event, we walked around Colonial Williamsburg for a bit and had lunch at one my favorite spots in this area, The Blue Talon, before heading back to Richmond. The event was a fun little getaway for the both of us — we learned a lot and had fun talking about what the rest of Kyle and Samantha's weekend must have looked like. 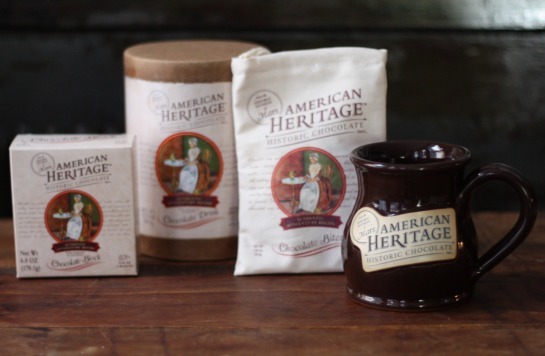 One of our readers will win a gift package including each of the pictured American Heritage Chocolate goodies — a muslin package of Chocolate Bites, 2 Chocolate Blocks, a container full of Finely Grated Chocolate Drink and a hand thrown American Heritage Historic Chocolate souvenir mug that was handcrafted in America. Learn more about each of these heritage chocolate products and where to buy them on the American Heritage website. American Heritage Chocolate generously provided us with all the goodies included in today's chocolate giveaway. All the delicious thoughts and opinions on the chocolate are our own — thank you so much for supporting the sponsors that make 17 Apart possible. I'm in line at the grocery store and a dark chocolate bar with cherries and pecans ended up in my cart ;) I LOVE chocolate! What a sweet event! I wish I was there. Thanks for sharing! I am addicted to Dove milk chocolates! Dark chocolate for sure! 80% cocoa at least...yum! Cadbury's fruit and nut bar. Yum! In line at the grocery store I would probably grab a bag of m&m's. Milk chocolate Lindt truffles would make it into my bag! Probably some dark chocolate almond bars! A high-quality bar of dark chocolate would find its way into my cart. I like to get my chocolate from B.A. Sweetie. I go for the Guittard when I can. At the grocery store I'm likely to get a milk chocolate with almonds or hazelnut. I don't buy chocolate in line at the grocery store! I save my cravings up and go to a drugstore and buy the lovely specialty dark chocolate bars. Any trip that I make to the grocery store invariably leads me down the chocky aisle where I cave into any NEW and different brand or flavor combo that I've never tried before. Milk Chocolate with almonds, usually Hersey with almonds!